“We need a volunteer for percussion — anyone up for stepping up for Gaynor’s ‘Step Up!’……?” I jumped at the chance, there is a surplus of clarinets and I have always wanted to try percussion…and for the Adopt A Composer piece – wow that gave me a buzz. I was up-front with the percussion section leader; “I should warn you that one of the reasons for volunteering is because my sense of rhythm is so bad I am keen to get it improved so please feel free to turn me down or sack me.” With magnitude and grace the reply was ” I will take anyone who is keen” – I was ‘in’… so in one fell swoop I had transferred my musical skills from blowing to… well counting, banging (claves), slapping (vibraslap) and whirling the inside of a washing machine above my head, yes you have read correctly! I will not say why or for what effect as that would be a serious plot spoiler suffice it to say this is all about creating an effect of nature. 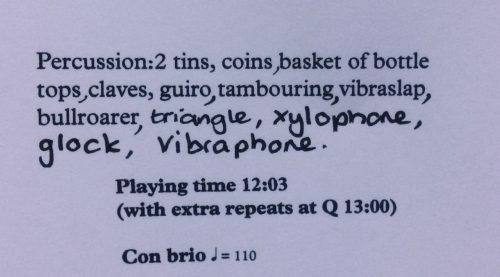 In the three weeks I have being playing my assortment of instruments I have learnt so much and I am amazed at the amount of multi-tasking a percussionist has to perform. Not only do I have to count, count, count I also have to work out how to get from one instrument to the other in enough time, and work out with which part of my body I am going to use to make the instrument ‘sound’ – it is truly a revelation and I am filled with a new admiration for the percussion section. I have also had to up my swimming – thank goodness I pack in 150 lengths per week as I have to swing that tubing for a long time high up in the air. Being part of Adopt A Composer is an experience I was never going to forget and only feel excited and honoured to be a part of… I for sure won’t be forgetting it now. Judy McCulloch, Ex Bb Clarinet, trainee percussionist.